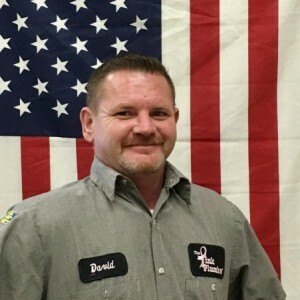 David L has a 5-Star rating and leads the company in total reviews, making this pro a ReviewBuzz Rockstar! I have worked in the Tampa Bay area preforming plumbing for most of my life. It will be my pleasure assisting with all of your plumbing needs. Called Pink Plumber at 0730 for a busted pipe. David L. showed up at 0900 and fixed everything right away. He was very polite, well-dressed, and articiculate. He was a true professional and is an asset to the company. I will be using Pink Plumber again. Woke up at 0715 to answer a phone call. Went out on the back porch to talk. Heard water gushing, looked around, saw puddles. Checked the Intex pool - ok, checked the drainpipe, ok. Looked beyond the drainpipe and saw the hole in the wall where the outside water spigot used to be. The spigot, still attached to the hose, was laying on the ground. The place on the wall, former residence of said spigot, was spewing water! After the mini freak out, I hung up and went outside to turn the water off. Called the pink plumber because I remembered that song from the commercials. He was here at 0900. David Lankford, Pink plumbers, professional and thorough. In the matter of a few short hours, he fixed the problem and gave a warranty for his work! My rating for this company, based on David's work, is A .
David is an amazing professional, very efficient, and very personable. Hopefully I won't need his specialized service very often, but I'll definitely ask for him in the event of future plumbing problems. I also really enjoyed the fact that he spoke very highly of his supervisor and coworkers. That's always a good sign. Plumber replaced the main water line from the street to the house. He was very knowledgeable, courteous & professional. He did an outstanding job. David was great, he assessed the situation knew what the problem was and fixed it. Very good experience, price quoted w/options. David is very knowledgeable, experienced, efficient and informative. The problem was solved and the cleanup was thorough. I would highly recommend The Pink Plumber, as well as David L.
This was a great experience. They installed 2 toilets & my new water heater. They were professional & did great work. Super clean and respectful. I look forward to using them again. Charged 350$ for a small c joint where the leak was. Which took only 30 minutes. However, was told it would require a valve to be replaced first. I feel cheater by a con. David was terrific...... a true professional in the way he handled me on pricing and his work was top notch. Our hot water tank was not working and it was less than 2 year's old so we searched for hot water tank repair and Pink Plumber came up they were here within 4 hours after my call and David the technician was amazing he found our problem and fixed it and for what they do for breast cancer awareness is great! David and Patrick were amazing! So helpful and friendly. We will definately continue to use Pink Plumber because of them. It never came to me but i wanted to give both of them a great review. They were very professional and help me to the best of thier ability. I would recommend them to anyone. Dave and Rob were very professional. They showed up on time and spent over a hour fixing our problem. I would recommend Pink Plumber to anyone.